3 Words: Steven Seagal Contest! 3 Words: Steven Seagal Contest! 3 Words: Steven Seagal Contest! Oh no! The season finale of Steven Seagal Lawman is upon us. Instead of being sad, we want to shower you with goodies to keep you smiling well into season 2. Here's how to play: Steven Seagal has grossed more the $2 billion in movies. He's an expert martial artist and marksman, an action hero, and a fully-commissioned deputy with the Jefferson Parish Sheriff's Office in Louisiana. Yes, he's an inspiration to us all. Now we want him to inspire you for our contest. Steven Seagal Lawman Limited Edition Collector's Set wrapped in a keepsake "bulletproof" vest featuring: "Steven Seagal Lawman" DVD with 2 full episodes, Steven Seagal "Mojo Priest" CD and "The Path Beyond Thought" DVD which documents Steven Seagal's work in Japan establishing his dojo and teaching Aikido. Please use a valid email address with your comment (you don't have to post it for all to see). We will only use email addresses to contact winners. You must be a U.S. resident to enter. The contest ends at 11:59 p.m. (EST) on February 3, 2010. Our Steven Seagal Lawman prize pack is courtesy of A&E. Please allow 4-6 weeks for delivery. 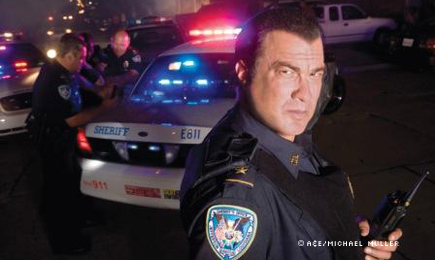 The season finale of Steven Seagal Lawman airs Wednesday, February 3 at 10:00 p.m. (EST) on A&E. Check out a sneak peek below. Steven Seagal Lawman Limited Edition Collector's Set wrapped in a keepsake \"bulletproof\" vest featuring: \"Steven Seagal Lawman\" DVD with 2 full episodes, Steven Seagal \"Mojo Priest\" CD and \"The Path Beyond Thought\" DVD which documents Steven Seagal's work in Japan establishing his dojo and teaching Aikido.